On Sunday we had another brew day at my place. Was time to do another Porter and a using some grain for the first time since the Brewsmith kits. There was bottling of the Australian Amber Ale and tasting of the Australian Pale Ale. Both are a lot darker than ‘amber’ or ‘pale’ and should be renamed ‘dark’ and ‘amber’. The tasting of the Amber was, how should I put this, bad. The idea behind the two brews really wasn’t thought out well enough. I had assumed the sugars in the liquid malt cans would mostly ferment leaving only a slight sweetness. I was very wrong. And I should have realised it when we did the gravity readings. Chas has a review that will be going up, but to summarise… it’s bad. The amber came in at lower gravity than the pale, so that might be worse. I’m not going to even attempt tasting the Amber Ale in two weeks. I think both beers need to condition for a number of months, maybe six or more. So, with that in mind I’m very glad we did a brew of something that should turn out a fair bit better. Or at least in theory. The brew can’t be classified as a ‘Partial’ because the grains used were crystal. That means no enzymes to convert starch into sugar, aka a mash. This was Steeping of the grains, and therefore this brew should be classified as an extract. Plus a can of amber liquid malt extract was used. There was 500 grams of Crystal (ebc 115-145) used. 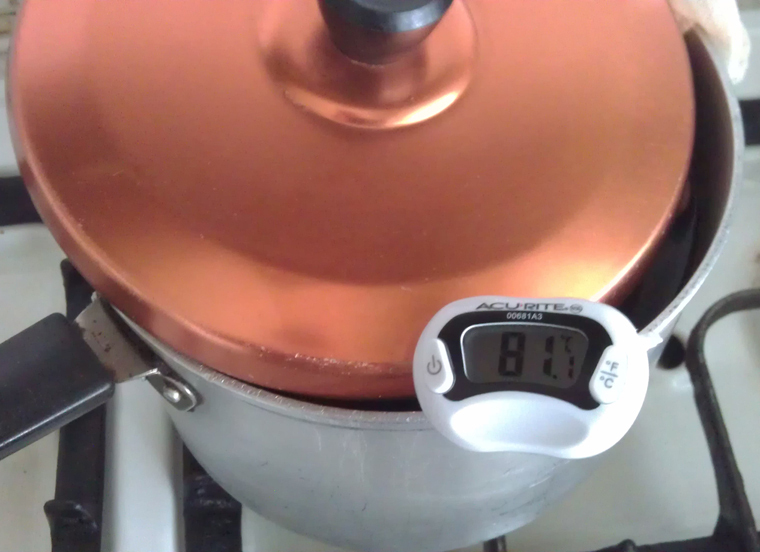 I wanted to get the most out of the grains so steeping occurred for a full 60 mins at around 80C. I say around 80C as the temperature wasn’t fully controlled the whole time. It dropped down to around 77C and was as high as 86C at one point. Not great. But, in defence it was only steeping and not mashing. And so the Baltic Porter started. After steeping there was a sixty minute boil. The can of liquid malt and the liquid from steeped grains were all thrown into the wort. Once the hot break occurred in went 7 grams of Warrior hops. After 30 mins there were 3 grams of Fuggles added. Then finally another 2 grams five mins before flame out. This was then put in the big 30L fermenter and topped up to the 10L mark. Windsor hops were added and fermenter given a good shake to get more oxygen due to the expected high alcohol. The original gravity was calculated at 1.081, but only came in at 1.072. That’s probably a good thing considering what happen to the two Australian Ales recently brewed. The day had some painful lessons. And they were kept to small batches so there’s not too much pain. If this Baltic Porter turns out bad I think it might be time to return to some kits for a little bit. PS. Forgot to mention we tasted the Black Rock Miners Stout and Gauss’ Law hopped cider. Review for stout is up and review of Gauss’ Law will be coming soon. I’ve never tried it myself, but a lot of brewers advocate late additions to the majority of the malt extract if the color of your extract based beers is coming out darker than you’d like. This will change the bitterness profile of your beer (add more bitterness relatively) but will keep the color of the beer from changing quite as much. There’s lots of info on this technique if you do a search for late extract addidition. Good luck on your brew, I’ll be happy to hear how everything turned out! Thanks. Will have to check it out. Got a few things planned for the next two brews before I return to the full extract style. Will absolutely read up a bit more and keen to see how late extracts change things.